Are you looking to reduce the amount of chemicals you use in your beauty routine? 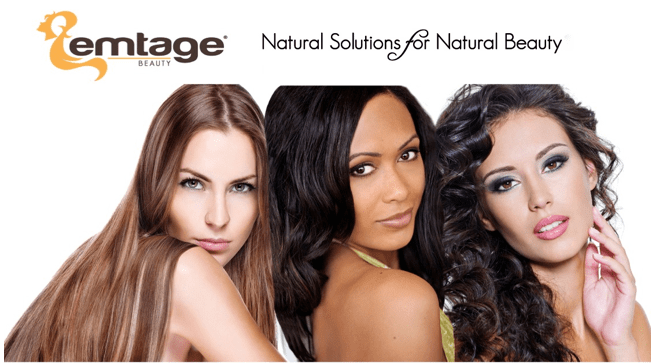 Emtage Beauty is a line of all-natural hair and skin treatment products infused with organic botanical oils. They provide a great alternative to other beauty products that are full of silicons, artificial ingredients and other chemicals. All of Emtage Beauty products use organic and 100% natural ingredients and are free of synthetics, preservatives, and parabens. One of their products is the SILKtage Rejuvenating Styling Serum, and is popular among television and film hair stylists! This serum tames, protects, and repairs hair, leaving hair healthy and frizz free! Oils used in this product absorb quickly without leaving an oily residue. This product works great with all hair types, but is especially helpful for those with dry, stressed, frizzy hair. It strengthens hair and restores moisture that is lost through styling heat, chemicals and the environment. Claimed to be the “holy grail of hair oils” by beauty editors and a favorite of television and film hair stylists, this serum uses all-natural, ancient oils from around the world to tame, repair, and protect for healthy, silky, frizz free hair. The lightweight, ultranourishing formula infuses your hair with antioxidants, vitamins, and natural botanical oils from around the world including Argan, Camellia, and Monoi oils that absorb quickly without oily residue, creating silky, bouncy, smooth texture and shine. This serum nourishes every hair type and is especially beneficial to dry, stressed, frizzy hair. It strengthens your hair from the root and restores moisture lost from styling heat, chemicals, and the environment. All of our products use organic and 100% natural ingredients and are free of synthetics, preservatives, and parabens. Sounds interesting. Where can I find the exact ingredients list for these products? I beleive you, of course, but I want to be sure I won’t have allergies for any of these components. Thanks for review! I would love to try the Island Beauty Balm™! I like the multi use skin cream. I like the Rejuvenating Styling Serum With Argan Oil. I would like to try the Island Beauty Balm™. I bet it smells amazing and I love tropical scents. I love the SILKtáge™ Clear Glo! I like the Island Beauty Balm. My favorite product is the Island Beauty Balm™! island beauty balm looks wonderful! The island body skin balm! I’d love to try the Island Beauty Balm. I really love the Island beauty balm. My favorite product is the Island Beauty Balm. I would like to try the Silktáge™ Rejuvenating Styling Serum With Argan Oil!! I would like to try the Island Beauty Balm and I love the smell of these products in my hair! I’d like to try the Island Beauty Balm- I have been looking for a new moisturizer and this looks like it could be a new favorite! I’d like to try the island beauty balm. I like Island Beauty Balm. I like the Island Beauty Balm – thank you. I would like to try the “Silktáge Scalp Repair”. I like the Silktage Scalp Repair.Wow! I am envious to win these awesome emtage products. I like the Silktáge™ Clear Glow – Treatment Cleansing Oil. The Silktáge™ Clear Glow – Treatment Cleansing Oil looks great!! I’d like to try the SILKtáge Clear Glow Treatment Cleansing Oil – SOMETHING should make me glow! I like the SILKtáge Rejuvenating Styling Serum. I would love to try the Scalp Repair! Rejuvenating with Argan would be a great product to try out. I like the Silktáge™ Rejuvenating Styling Serum (With Argan Oil). But, I also like the cleansing oil. I would like to try the cleansing oil. I like the Silktáge Clear Glow – Treatment Cleansing Oil. I love the scalp repair! My favorite would be the silktage scalp repair.I need that. Silktáge™ Rejuvenating Styling Serum (With Argan Oil), controls my hard to tame flyaways. I would like to try Silktáge™ Scalp Repair. I would love to try the Silktáge™ Clear Glow – Treatment Cleansing Oil. I looked at their website. I definitely like the SILKtage Rejuvenating Styling Serum. I have curly/wavy hair. It tends to get frizzy. I would love to try this out! Silktáge™ Clear Glow Treatment Cleansing Oil by far!! Silktáge Clear Glow – Treatment Cleansing Oil. I would love to try the Silktáge™ Rejuvenating Styling Serum (With Argan Oil) and (without Argan Oil). I would also love to try the Silktáge™ Scalp Repair. clear glow cleansing oil is my fave! The Clear Glow product would be my first choice. Silktáge™ Clear Glow – Treatment Cleansing Oil. CLEAR GLO TREATMENT CLEANSING OIL IS MY FAV. my skin is aging & would benefit from the antioxidants ! I love treatments so the Silktáge™ Clear Glow – Treatment Cleansing Oil really caught my eye.